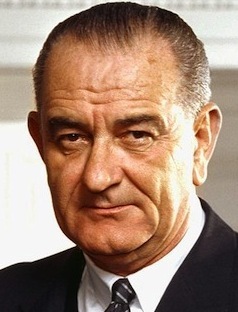 Lyndon B. Johnson became the 36th president of the United States after the assassination of John F. Kennedy. During Johnson’s term, the United States became heavily involved in the Vietnam War. As the war dragged on, many Americans were upset about the nation’s involvement in Vietnam, and Johnson’s administration was often criticized for not ending the war sooner. Johnson’s education at Southwest Texas State Teachers’ College had him on track to become an educator. After he graduated, he began working at a local Texas high school, where he taught public speaking and debate. In 1934, Johnson married Claudia Alta Taylor and together they had two daughters. Claudia, more commonly known as Lady Bird Johnson, was an intelligent and resourceful woman. She not only funded his first campaign with a small inheritance, but she also made the couple wealthy through the purchase of a local radio and TV station. Johnson entered politics when he campaigned for Welly Hopkins during his run for Congress. Johnson was then appointed as Congressman Richard M. Kleberg’s legislative secretary. In 1937 the Democrat was elected as a United States representative, and in 1949 he was elected senator and served as Senate majority leader, Senate minority leader, and Senate majority whip. In 1960, Johnson was nominated as Kennedy’s running mate and went on to become vice president until 1963, when he ascended to the presidency after Kennedy’s assassination. During Johnson’s presidency, he touted various platforms, including civil rights, public broadcasting, educational aid, Medicare, and Medicaid. He was especially outspoken about the “War on Poverty” (see video below). However, one of the most dominating events in Johnson’s presidency was American involvement in the Vietnam War. During the war, Johnson sent more than 550,000 combat troops to Vietnam. As the number of American casualties climbed, a large anti-war movement blossomed, and in 1965 crime rates began to climb as a number of riots took place across America. All these events caused Johnson to reassess his bid for re-election — and after the 1968 New Hampshire primary, Johnson bowed out of the race. In 1928, Johnson took a nine-month post to teach poverty-stricken Mexican-American children attending a segregated school in Cotulla. The position had a profound effect on Johnson, and he said it was a turning point for him in realizing the importance of basic education for all Americans. Johnson served in the four elected federal offices of the U.S. government as representative, senator, vice president, and president. Only four presidents have the distinction of having done so; the other three were John Tyler, Andrew Johnson, and Richard Nixon. Under Johnson’s administration, the Civil Rights Act and Voting Rights Act were passed. These laws were put in place to ensure minorities’ right to vote as well as ending segregation.